In addition to co-stars, Joe Mantegna, A.J. 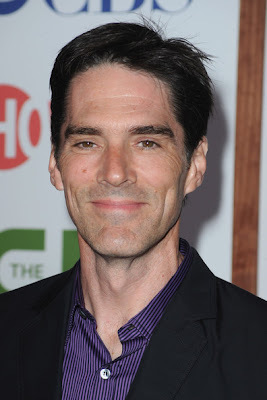 Cook, Paget Brewster and Kirsten Vangsness (shown in an earlier post), CRIMINAL MINDS star Thomas Gibson was out for last night's 2011 CBS Press Tour Stars Party in LA. Gibson, who recently signed a new deal to stay on the series after some controversy, will be portraying Unit Chief Aaron Hotchner for a Seventh Season on the hit CBS program. Sadly, LOVING MOORE favorite (We're called "LOVING MOORE" for a reason) SHEMAR MOORE and Matthew Gray Gubler apparently did not attend. We were hoping for new photos of all of our beloved profilers.